Tabletop fantasy roleplaying has grown up a lot since the 80’s, when kids like ones in Stranger Things faced down demigorgons in their parents’ basements. While plenty of gamers still focus on killing monsters with a broadsword, the new century has brought a cornucopia of new ideas: games about surviving cancer or a harsh Icelandic winter, massive distributed roleplaying campaigns about a world after peak oil, live-action games about refugees and occupation. And, now, with Benjamin Rosenbaum’s Dream Apart, a social-justice oriented Jewish historical fantasy game drawing inspiration from Sholom Aleichem, Isaac Bashevis Singer, and the Talmud… but also from the gritty social realities of an Eastern Europe beginning to encounter the Industrial Revolution. In Dream Apart, players might portray a heretical Sorcerer who has heard ghosts whisper the name of a murderer, a sharp-eyed Matchmaker wielding social power to get her son out of the hands of the czarist miliita, a pantheist Midwife standing up to the rabbinical council to defend prostitutes and tailors’ apprentices, or a rascal Klezmer simultaneously romancing the Bandit Queen and the lieutenant of the revolutionaries. 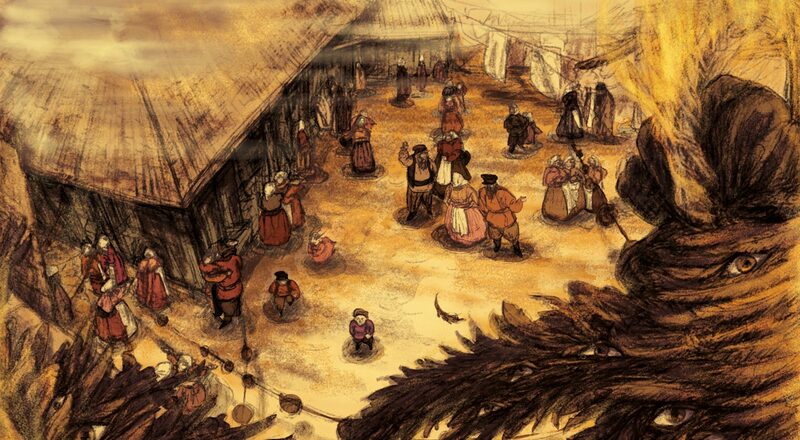 Where traditional games rely heavily on statistics, dice, and rules, requiring extensive advance setup and planning, Dream Apart lets players dive right in, generating — right at the table — the shtetl’s blessings and curses, its characters’ relationships and attitudes, and the dramatically charged situations that arise from them. Though their settings are fantastic and their approach dramatic and fun, the two games share a serious agenda — players creating stories of belonging outside belonging. “There’s a lot of contrast between these two games – one is Jewish historical fantasy, the other is queer speculative fic. But at their core, they’re both games about marginalized people finding agency and building community,” says Alder. Learn more and check out the kickstarter!